Using innovation as a proxy for the uptake of digital technology in developed economies, competitiveness of the top countries seems to line up fairly well with innovation. For example, nearly all of the top 10 countries named on the World Economic Forum Global Competitiveness Index also top the Global Innovation Index from INSEAD and the World Intellectual Property Organization. This is not surprising as countries like the UK and Singapore, which appear in the top 10 of both lists, are national economies that share high marks in the indicators that make up both the competitiveness and innovation indexes. These include factors such as strong infrastructure, high technological readiness, and a well-educated workforce – generally considered the building blocks of competitiveness, and, it would now seem, innovation. This pattern also holds true, for the most part, when it comes to countries that are considered lower-income or emerging economies. These countries often have lower ratings on indicators such as infrastructure, technological readiness, and education. Thus, their innovation ratings line up with their competitiveness ratings. But when you look to anecdotal evidence of innovation, the picture is a little less clear. In other words, there are some truly successful and very competitive companies using advanced technologies – but in countries that have distinctly lacklustre national competitive performance. Developing countries like Kenya, Argentina, and Brazil have local enterprises that are taking full advantage of innovative business models enabled by advanced technologies. Kenya – often referred to as the ‘Silicon Savannah’– is home to the influential M-Pesa that has revolutionized sectors like banking and retail in Africa with its use of digital and mobile technology. Yet Kenya as a nation has seen their competitiveness rank fall over the past two years. Similarly, Argentina is home to the majority of Latin America’s tech unicorns. But again, their national competitiveness ranking has gone from 94 in 2013 to 104 in 2017. Brazil is the largest manufacturer of regional jets in the world and among the top five manufacturers globally in this high-tech field. But its national competitive ranking has dropped from 48 in 2013 to 81 in 2017. Even in more mature economies, innovative companies are not necessarily a harbinger of national competitiveness. Korea – where Samsung is considered an innovation leader – has lost national competitiveness over the past few years, going from 19 in 2013 to 26 currently. China, which is home to 6 of the top 50 most innovative companies on Fast Company’s 2017 list, is still having difficulty cracking the top 25 when it comes to the national competitiveness index. 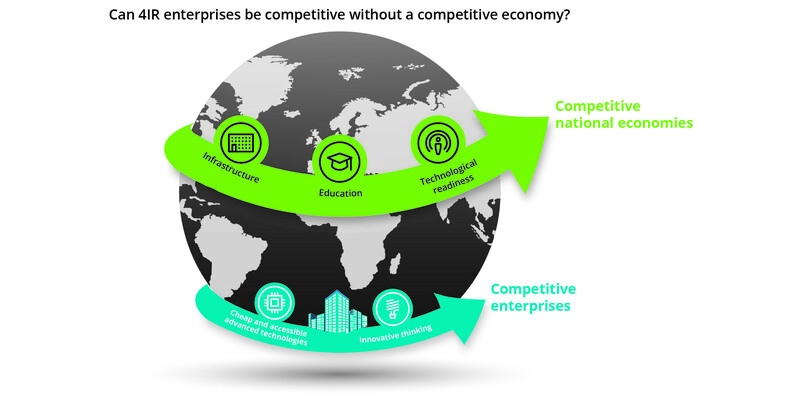 There seems to be another factor that is impacting the national competitiveness of all these economies despite the innovation accomplishments of their individual enterprises: the business environment. Ranging from labour policies and inflation to taxes and corruption, these are national economies where doing business is hard. For China and Korea, labour policies and inefficient bureaucracy are key factors that make doing business in their countries challenging. For Brazil and Kenya, corruption figures loom large along with policy instability. Currency instability is triggering uncertainty in Argentina as well as in China. Of these countries, only Korea appears in the top ten of the World Bank’s 2017 Ease of Doing Business survey (but it fell one spot from 2016). None of the others even appear in the top 50. So what does this all mean? Well, it certainly tells us there are some amazing companies out there that somehow are innovative and competitive despite the headwinds of their national economies. While that makes a great story, it isn’t a sustainable model. In general, innovative companies spur competition and competition spurs new business models enabled by advanced technologies (think 4IR) that create new markets. But you can only scale this kind of competitiveness and innovation across a national economy by having business friendly public policies such as low taxes, efficient regulation on labour and business, and low corruption; and economic stability such as stable currency, low unemployment, and quality jobs. The real lesson here might be: enterprises who adopt innovative business models enabled by advanced 4IR technologies are in a class by themselves. The very lifeblood that fuels the 4IR is a disruptive mindset enabled by accessible and cheap technology—not necessarily favourable business environments or high marks in competitiveness factors. As such, innovative 4IR enterprises seem to have the ability to outperform the national economies they function in. But with a strong business environment, this success could very well translate into national competitiveness.